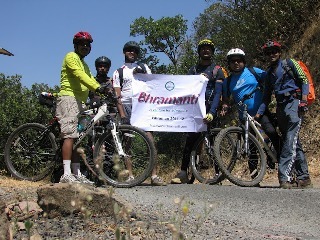 Yet another Heavenly ride for Bhramantian Cyclist enthusiasts. Blessed by drizzle & cool breeze throughout the ride on 26th Aug 2012 Sunday, the nature was at its best. This was the 3rd Cycling ride this monsoon season. This circuit was much awaited one. We managed to clock 80 kms winding through highway, state roads, perforated roads, uphills, downhills, forests & the beautiful serene Bhandardara lake. Spent the Saturday night at Prasad's home at Kasara. We were 4 of us - Prasad, Lalitesh, Sandeep. Ferried our bikes till Ghoti. We started off our ride at about 9.30am . We were blessed right from the onset of our ride by drizzle. The road was good & hence the ride. After the long ardous climb, we passed the village Bari, the base of Kalsubai peak. Reached the Shendi village after yet another climb thru the rough road of 6km. Took a break & enjoyed a sumptous breakfast at Amruteshwar hotel at Shendi. 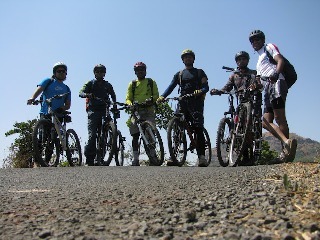 The next course of our ride was through the forests & skirting the Bhandardara lake back to Shendi village. This was an amazing ride through small paddy fields, couple of tiny villages, hamlets, grazing creatures. The hills always kept to our left, the lake on to our right while the heavens kept drizzling. 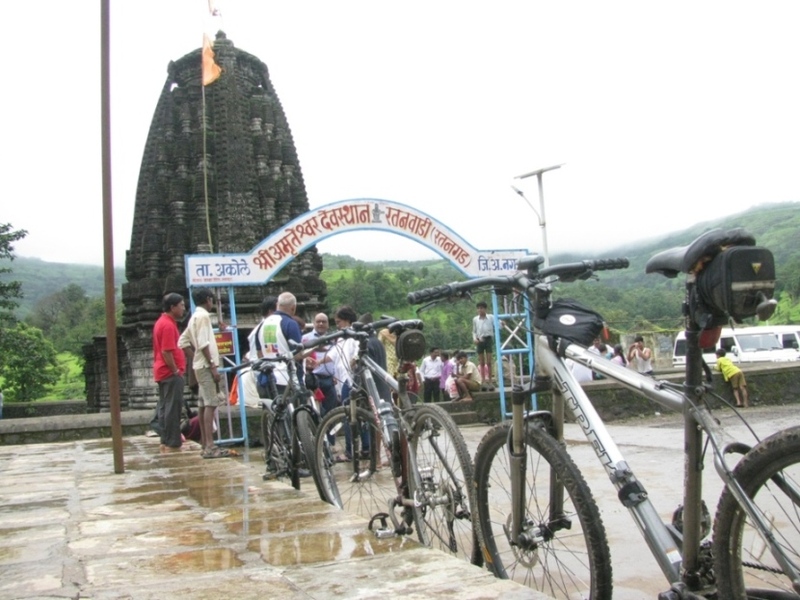 We reached Amruteshwar Temple after the 18km ride which is base village of Ratangad fort. Offered our prayers & started for Ghatghar. We passed through the Samrad village & reached Ghatghar about 12 kms ahead. Had a small bite besides the Gharghar project Dam. After clicking another set of memories, we started continuing our journey towards Shendi village to complete the lake circuit. Its around 42 kms. The ride back to Ghoti village was quite tiring & it was already quite dark. Overall, the experience was an Amazing ride & an awesome rendezvous with nature. 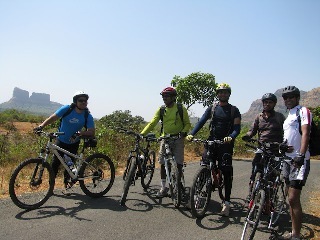 All 6 participants successfully completed the much awaited cycling tour starting from Lonavala & circuiting INS Shivaji, Ambavne, Telbaila, Tamhini, Mulshi lake & back to Lonavala. Kiran S, Lalitesh m, Prasad K, Winnith R, Jolly P, Sandeep A. It was a 2 days event marked with an overnight stay scheduled at Tamhini Village near the Winzai Temple. We encountered about 2 ghats sections on day1 while on the way near the INS Shivaji & the Col of Telbaila. The ride was pleasant till about 2 pm. But later it was extremely hot on the plains near Tamhini. We passed through forts of Korigad, Ghangad & Telbaila. Ride was however quite enjoyable & cool near the areas of vegetation. The night stay was quite cold! We cycled about 70 kms on day1 with lots of bad roads as well as good ones. Days was involved in skirting the Mulshi lake for about 4-5 hrs. It went through the bad roads & ghat while we passed the Amby valley onto our left side. 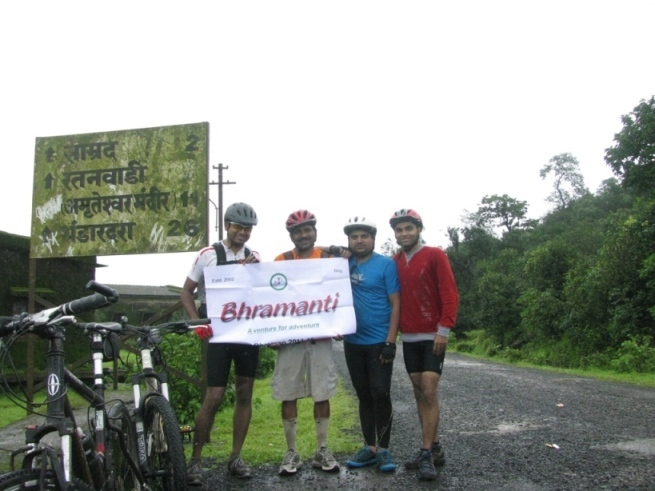 Finally we reached Ghushalkhamb junction & back to Lonavala riding about 75 kms on day2. Overall, it was much awaited ride for the cyclist group who had been quite eager to venture out especially when were not able to do any Konkan trip since couple of years!